Duchenne Muscular Dystrophy (DMD) is one of the most common types of genetic disorder that results in muscle degeneration. Currently there is no curative treatment for DMD, however, various organizations are investing in the research and development, in order to find an effective treatment for DMD. Gene therapy as the treatment for DMD is in an early stage of development. The U.S. Food and Drugs Administration (FDA) in 2015 published guidelines for developing a drug for duchenne muscular dystrophy. Hence, these guidelines are expected to contribute towards new drug development to treat duchenne muscular dystrophy. Most of the DMD disorders can be detected during pregnancy, technically advanced devices are being developed for muscle biopsy test and prenatal tests for diagnosis. Also, small drugs for downstream defects are in clinical trials. However, lack of standardization to measure efficacy across all the stages of DMD and the high cost of novel drugs are hampering the growth of the global duchenne muscular dystrophy market. The report on the global duchenne muscular dystrophy market gives important perceptions on the overall market. The report offers critical insights focusing on the financial and technical details of the market. The market research report aims to provide key trends, various driving factors, opportunities in the market and factors hampering the market growth. 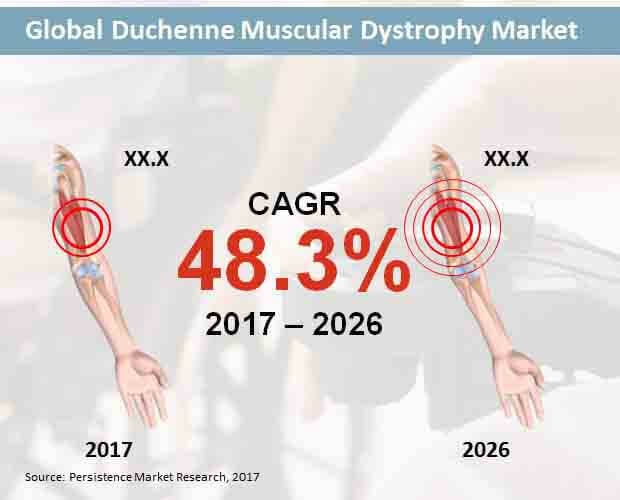 The worldwide duchenne muscular dystrophy market analysis report includes market overview, growth, demand and research on the performance of the market in major regions across the globe. Both primary and secondary research was done by the expert analysts to provide a forecast on the market including revenue, CAGR, and year-on-year growth along with the information that will impact the market in the long run. The primary research was done by conducting interviews with market experts and details provided by them were crosschecked with valid sources. While, financial reports, annual reports of the key companies and investor presentation formed the part of the secondary research. The report also comprises SWOT analysis, Porter’s Five Force analysis. The report also provides regional overview along with market segmentation along with the details on the most attractive segments in the global duchenne muscular dystrophy market. The report also provides competitive landscape including profiles of the key players operating in the global duchenne muscular dystrophy market. The report offers details on the key players including financial overview, company overview, product portfolio, key developments and long-term and short-term strategies by businesses. The global duchenne muscular dystrophy market is segmented on the basis of product type, distribution channel, therapy, and region. On the basis of product type, the market is segmented into NSAIDs, Corticosteroids, and other products. By distribution channel, the market segmentation includes Hospital Pharmacies, Retail Pharmacies, and online pharmacies. Based on the therapy, the market is segmented into Mutation Suppression, Exon Skipping Approach, and other therapies. The global duchenne muscular dystrophy market segmented on the basis of region includes Europe, Japan, Latin America, Asia Pacific Excluding Japan (APEJ), North America, and the Middle East and Africa (MEA). Duchenne Muscular Dystrophy (DMD) is a muscle degeneration and is a genetic disorder which is X-linked recessive. However, it is also inherited from parents or caused due to a new mutation. There are various therapies and drugs to control DMD, however, there is still no cure for duchenne muscular dystrophy. Major driving factors in the global duchenne muscular dystrophy market are the introduction of novel drugs and therapies, disease-modifying therapies, strong support from various companies for drug development and support from patient advocacy groups on the regulatory approval process. Moreover, mutation-specific therapies are likely to emerge as a major breakthrough in the duchenne muscular dystrophy treatment. Drug developers are also focusing on developing new drugs and therapies targeting newborns, young infants and also the last-stage DMD patients. In the last few years, there has been rapid development in the duchenne muscular dystrophy therapeutics. However, there is still a large number of patients who are not able to benefit from therapies and drugs due to its high cost and lack of awareness. Compared to the various products, corticosteroids are likely to emerge as the top-selling products during 2017-2026. By 2026 end, corticosteroids are projected to surpass US$ 9,000 million revenue. Various scientific research has found that compared to various products to treat duchenne muscular dystrophy, corticosteroids help in improving muscle strength for up to two to five years, however, long-term benefit of corticosteroids is still not clear. Hospital pharmacies are likely to be the largest distribution channel between 2017 and 2026. Towards 2026 end, hospital pharmacies are projected to reach more than US$ 6,200 million revenue. Increasing number of people are being hospitalized for duchenne muscular dystrophy. Hence, drugs for duchenne muscular dystrophy are being sold on a large scale through hospital pharmacies. Also, governments of various countries are investing in the development of hospitals in urban as well as rural areas, this is also contributing to the growth of hospital pharmacies. Among various therapies available for duchenne muscular dystrophy, mutation suppression is likely to be one of the highly preferred therapy for duchenne muscular dystrophy. By 2026 end, mutation suppression is projected to surpass US$ 6,000 million revenue. Mutation suppression therapy in duchenne muscular dystrophy targets the specific mutation causing the muscular dystrophy. Also, nonsense mutation suppression therapy has offered potential benefit to a lot of people suffering from duchenne. However, several therapies are currently under clinical trials, while some are close to getting approval by the Food and Drugs Administration (FDA). Europe is likely to emerge as one of the leading region in the global market for duchenne muscular dystrophy. Europe is projected to surpass US$ 4,900 million revenue by 2026 end. Meanwhile, North America followed by the Asia Pacific Excluding Japan (APEJ) are also likely to see a robust growth between 2017 and 2026. Some of the major companies operating in the global market for duchenne muscular dystrophy include ITALFARMACO S.p.A., FibroGen, Inc., Summit Therapeutics plc, PTC Therapeutics, Santhera Pharmaceuticals, and Sarepta Therapeutics, Inc.